Scientists at Tokyo Medical and Dental University have discovered a cyclic decapeptide with the ability to transport anticancer peptides into cancer cells. Findings published recently in Bioconjugate Chemistry suggest a promising lead compound could be capable of delivering therapeutic peptides to target drug-resistant cancer cells. The research, which took place at Tokyo Medical and Dental University (Tokyo, Japan), highlighted the ability of a cyclic decapeptide to bind a proapoptotic domain (PAD) peptide and act as an intracellular ‘delivery vehicle’. The membrane impermeable PAD peptide, [KLAKLAK]2, is known to have antimicrobial activity, as well as the ability to induce cell death by causing mitochondrial membrane disruption. This is a type of cationic antimicrobial peptide, which are attractive therapeutics due to their cytotoxic and anticancer activity, particularly in drug-resistant cancers. PAD is suggested to have anticancer effects due to a multifunctional defence system that exists in multicellular organisms. However, the peptides cannot penetrate the cell membrane and have little cytotoxicity without doing so. 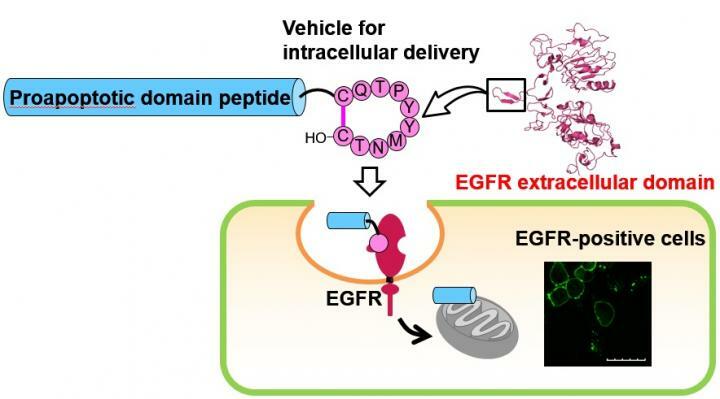 The researchers aimed to verify the selectivity of the cyclic decapeptide, termed peptide 1, to the EGF receptor (EFGR) – a receptor involved in controlling signal transduction that is commonly overexpressed in cancer cells. The PAD can be attached to peptide 1 for transport through the cell membrane, and, by binding to EGFR, has the potential to slow or halt cancer progression. "As a proof-of-concept study, the cellular delivery of the PAD peptide was challenged by conjugation with peptide 1," explained Kei Toyama, first author of the study. "The cellular uptake of a conjugated peptide 2, composed of peptide 1, the PAD peptide, and a linker cleavable with a protease, was evaluated by treatment of an EGFR-positive lung cancer cell line." Comparatively, ‘conjugate 3’, which did not contain peptide 1, and the PAD peptide alone had no inhibitory effect on the cancer cells. "Our findings suggest peptide 1 is a promising lead compound as a new intracellular delivery vehicle for therapeutically effective peptides," concluded senior author, Hirokazu Tamamura. "Also, conjugate 2, with its apoptosis induction activity, can be explored as a new apoptotic peptide that could contribute to the development of anticancer reagents based on the AMP functions," he added.